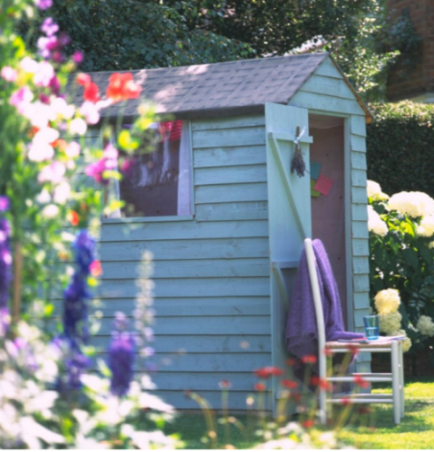 Looking for the best shed to keep your garden shipshape this summer? Look no further because we’ve sourced the best sheds currently on the market. So what should you be looking out for when it comes to buying a shed that suits your needs? We’ve asked shed specialists, Forest, for a handy guide to help you make the right choice. Think about how your shed will be constructed. The way the timber boards clad the outside of your shed are important. They all behave in different ways as weather conditions and seasons change, but there are advantages to each. Overlap – rough sawn boards that overlap each other allow flexibility and movement and rain water to run off. Shiplap – interlocking tongue and groove boards with a unique profile. The tight fitting nature of this method of construction reduces penetration from bad weather. Shed floors receive their fair share of wear and tear, so make sure yours can withstand frequent use. Alternatively, consider the appearance if you’re creating a garden room. Hard wearing sheet material (also referred to as OSB) is ideal if you’re on a budget and using the shed for general storage. If you’ll be spending more time inside – maybe a potting shed or a workshop or if you’re storing heavier items it’s always better to look for a pressure treated boarded floor to provide extra strength. Plate hasp and staple latch are a fairly standard yet essential feature of all sheds, add a sturdy padlock of to ensure items inside are kept secure. Another option is a Rim lock door latch which offers security and ease of use. Some sheds also come with additional features like hidden hinges (so they can’t be unscrewed from the outside) and windows fixed with security screws. If you don’t want your possessions on show consider windowless options. Dip treatment is a surface treatment which provides around 10 years anti-rot guarantee, Dip treated sheds offer good value but it’s worth knowing that these sheds will need annual re-treatment. Pressure treated sheds have anti-rot preservative treatment forced into the timber at pressure – they come with a 15-year anti-rot guarantee and don’t require any retreatment so can work out more cost effective in the long run. A pent roof is a single or sloping roof allowing water to run off to the rear and creating high head room at the front of the shed. These sheds are ideal for placing against a wall of a fence. A traditional apex roof is a popular choice. With two sloping sides, it’s highest point will be in the middle of the shed. It’s always worth checking the height of the shed eaves and also the door height when you’re shopping around – especially if buying online, some sheds are shorter than others. There are also other styles including Reverse Apex and Corner sheds so think about where you want to position your shed, where you want any windows to face and shop around to get one that best suits your space. Felt is the traditional material or choice when it comes to sheds, green mineral felt is especially long lasting. As an alternative Onduline is a unique corrugated material that is attractive and lightweight. Polycarbonate glazing is unbreakable and won’t become yellow or brittle over time. Acrylic glazing is slightly thicker, more durable and offers the closest resemblance to glass. For those that don’t want to blow the budget, you can pick up a quality shed for not-a-lot-of-money. This Rowlinson design is a fine example. It might be at the bottom end of the market in terms of cost but it’s up there with the best in terms of features. Made with a solid board roof and floor, mineral felt roofing this quality wooden shed delivers big on a small budget. Plastic fantastic. You wouldn’t necessarily know this design was plastic, thanks to it’s weathered wood-look texture. The structure is a weather-resistant double wall build with steel reinforcement, a heavy-duty floor and a robust ceiling. To add a further touch of charm the design features Victorian-style windows, a skylight and practical double doors. Metal designs are the perfect opportunity to embrace colour. Rather than the galvanised steel stand out like a sore thumb, we’re in favour of a sophisticated shade of green to help it blend in seamlessly. The metal design is windowless and features lockable handles – ideal if the contents are valuable, therefore security is a priority. The doors are on a sliding mechanism, to save space. For small gardens a slim shed is the perfect storage solution. This statuesque wooden shed is less than a metre in width, making it ideal for even the smallest of outdoor spaces. Due to its size, this design will not take up much space, but still offers plenty of room to store all your garden essentials. This shed is constructed using straight cut boards that overlap to give flexibility, allowing natural movement of the timber during the changing seasons. The roof and floor are made from solid sheet material and the roof is finished with black sand felt. This heavy duty, sizeable shed gives you plenty of space to store away garden equipment, bicycles or other large items. As well as offering room for storage, there’s plenty of space for shelving and a workbench, making it an ideal workshop space. The double doors make it easily accessible. Featuring a solid timber boarded floor – pressure treated for longevity – it’s strong enough to cope with heavy loads. The windows have an unbreakable polycarbonate glazing. Manufactured in the UK using FSC certified timber from sustainable sources. All fixtures, fittings and felt are included, along with easy to follow instructions. When just any old shed won’t do, there’s the John Lewis of sheds. This luxury design by National Trust feels more like a shepherd hut than a garden shed. The traditional design, constructed from FSC certified Scandinavian redwood, features vertical sawn boards, corrugated roofing, log store and a quaint square window. Although the design features a timber floor, it does require a base constructed of either paving slabs laid on mortar or a concrete base no less than 10cm thick. Inspired by National Trust properties the stylish model’s available in a variety of attractive colours. From Painter’s Grey to Terrace Green, this shed is made to be seen. Do you need to replace your garden shed? Is it leaking, rotting, falling down or just no longer serving its purpose? When it comes to choosing a shed for your garden it’s essential to choose the right style and size shed to meet your requirements and to find a company that is building sheds to last. A slapdash, poorly-constructed shed will last you a few years at best and will end up costing you more in buying a new one just a few years down the line. It’s a false economy to buy a shed at too cheap a price to start with. As an integral feature in your garden and an important outdoor storage facility, it’s worthwhile to get a quality shed that does the job it’s supposed to do for as long a time as possible. A shed, if well-built, should be strong, durable, secure and weather resistant. Choosing the right shed is dependent on what you intend to use the shed for and how much you have to spend on it. Are you looking for quality sheds for sale? Aston Sheds offers everything from storage garden sheds to pigeon lofts. What’s in a shed? Generally speaking, a whole lot of storage. The back garden shed is a familiar sight to all of us. This single-storey, all-wood constructed outbuilding is often used as a workshop, for recreational activities, or of course, as a place of storage. The vast majority of sheds are garden sheds, and sheds built on allotments. The potting shed or tool shed also fits into this category as a place in which lawn mowers, garden implements, firewood and other paraphernalia is stored away from the house. Sheds provide you with a range of garden storage solutions. Some sheds are crammed into the smallest of spaces around the back of a house, while others are installed on a lawn amidst a wide garden expanse. It doesn’t matter what size your garden is, as sheds can be built to meet size specifications. A shed designed and built from scratch to suit your requirements will generally give you the best value for money. Buy a shed that’s strong, made from quality materials and built to last. Have you started the search for quality storage sheds? Building quality storage sheds is our business at Aston Sheds, and we do it well.